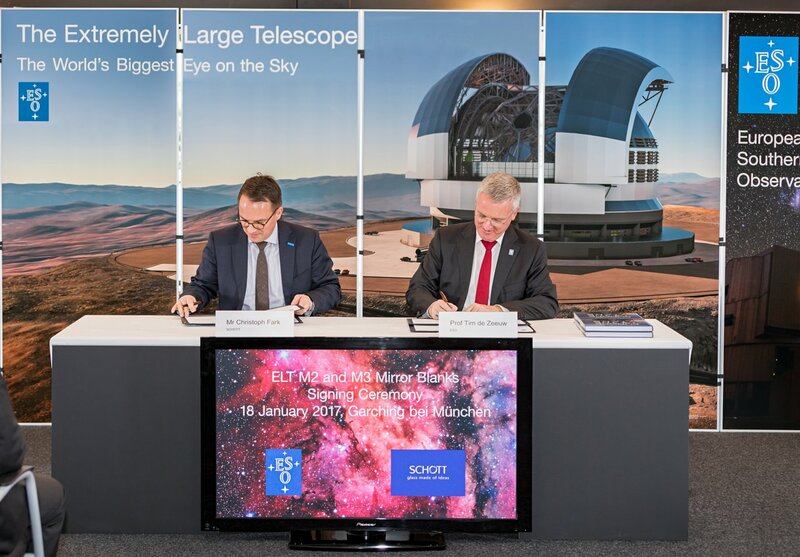 At a ceremony today at ESO’s Headquarters four contracts were signed for major components of the Extremely Large Telescope (ELT) that ESO is building. 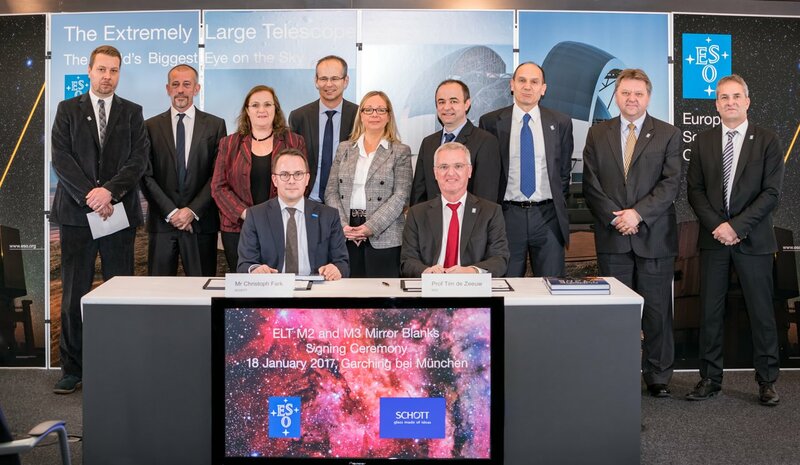 These were for: the casting of the telescope’s giant secondary and tertiary mirrors, awarded to SCHOTT; the supply of mirror cells to support these two mirrors, awarded to the SENER Group; and the supply of the edge sensors that form a vital part of the ELT’s huge segmented primary mirror control system, awarded to the FAMES consortium. 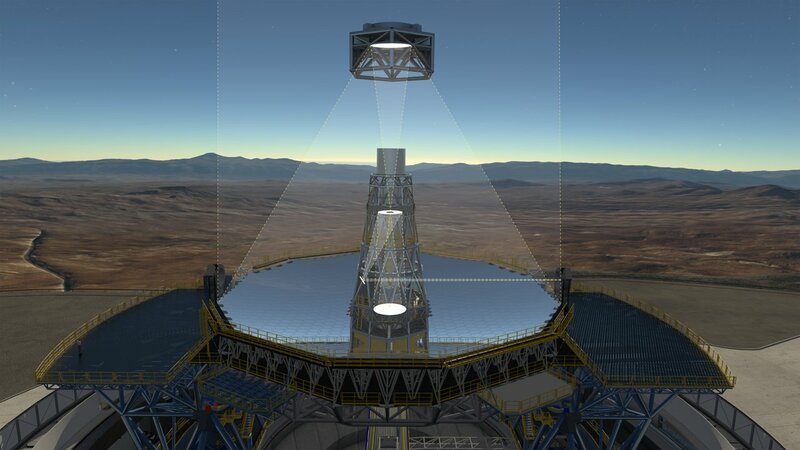 The secondary mirror will be largest ever employed on a telescope and the largest convex mirror ever produced. The construction of the 39-metre ELT, the largest optical/near-infrared telescope in the world, is moving forward. The giant telescope employs a complex five-mirror optical system that has never been used before and requires optical and mechanical elements that stretch modern technology to its limits. 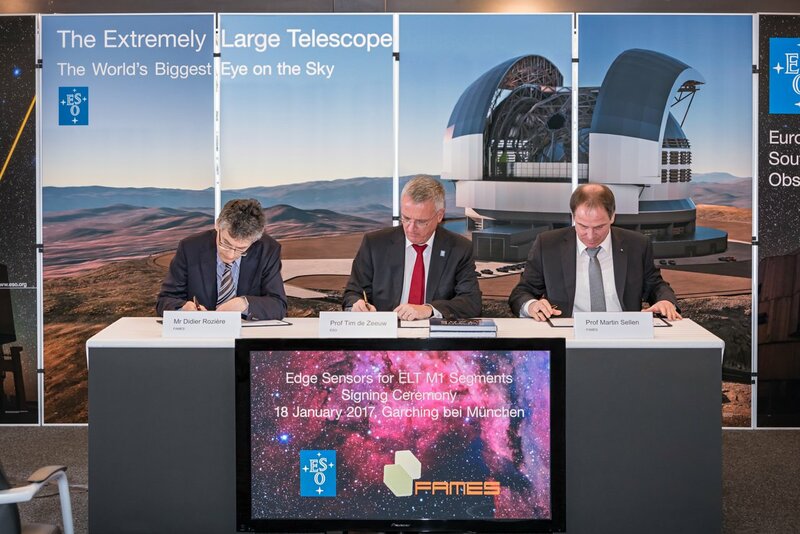 Contracts for the manufacture of several of these challenging telescope components have just been signed by ESO’s Director General, Tim de Zeeuw, and representatives of three industrial contractors in the ESO Member States. The first two contracts were signed with SCHOTT by Christoph Fark, Executive Vice President. They cover the casting of the ELT’s largest single mirrors — the 4.2-metre secondary and 3.8-metre tertiary mirror — from SCHOTT’s low-expansion ceramic material Zerodur© . Hanging upside-down at the top of the telescope structure, high above the 39-metre primary mirror, the secondary mirror will be largest ever employed on a telescope and the largest convex mirror ever produced . The concave tertiary mirror is also an unusual feature of the telescope . 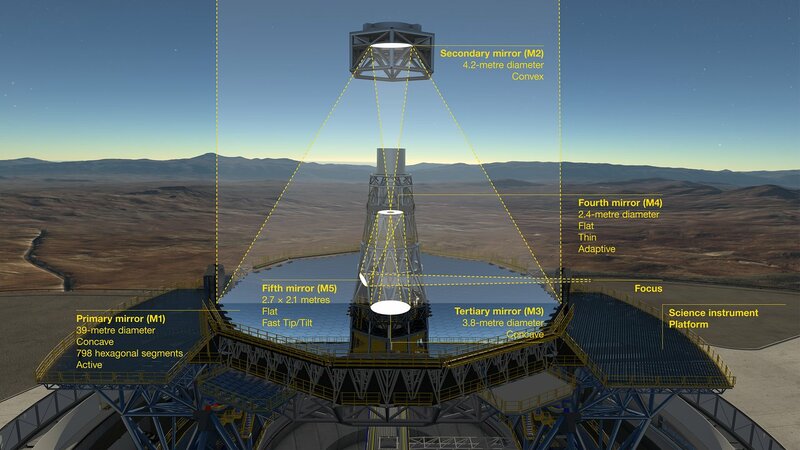 The ELT secondary and tertiary mirrors will rival in size the primary mirrors of many modern-day research telescopes and weigh 3.5 and 3.2 tonnes respectively . The secondary mirror is to be delivered by the end of 2018 and the tertiary by July 2019. 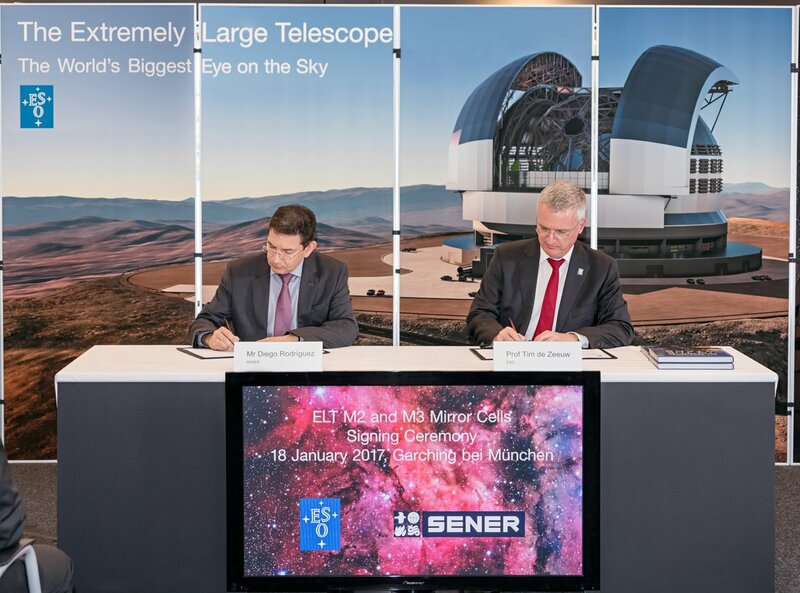 The third contract was signed with the SENER Group by Diego Rodríguez, Space Department Director. It covers the provision of the sophisticated support cells for the ELT secondary and tertiary mirrors and the associated complex active optics systems that will ensure these massive, but flexible, mirrors retain their correct shapes and are correctly positioned within the telescope. Great precision is needed if the telescope is to deliver optimum image quality . The fourth contract was signed by Didier Rozière, Managing Director (FAMES, Fogale), and Martin Sellen, Managing Director (FAMES, Micro-Epsilon), on behalf of the FAMES consortium, which is composed of Fogale and Micro-Epsilon. The contract covers the fabrication of a total of 4608 edge sensors for the 798 hexagonal segments of the ELT’s primary mirror . These sensors are the most accurate ever used in a telescope and can measure relative positions to an accuracy of a few nanometres. They form a fundamental part of the very complex system that will continuously sense the locations of the ELT primary mirror segments relative to their neighbours and allow the segments to work together to form a perfect imaging system. It is a huge challenge not only to make sensors with the required precision, but also to produce them quickly enough for thousands to be delivered to the necessarily short timescales. The signing ceremony was also attended by other senior representatives of the companies involved and ESO. It was an excellent opportunity for representatives of the contractors producing many of the giant telescope’s optical and mechanical components to get to know each other informally as they begin to help create the world’s biggest eye on the sky. Zerodur was originally developed for astronomical telescopes in the late 1960s. It has almost no thermal expansion, which means that even in the case of large temperature fluctuations, the material does not expand. Chemically, the material is very resistant and can be polished to a high standard of finish. The actual reflective layer, made of aluminum or silver, is usually vaporised onto the extremely smooth surface shortly before the telescope is put into operation. Many well-known telescopes with Zerodur mirrors have been operating reliably for decades. They include, for example, ESO's Very Large Telescope in Chile. As it is a highly convex, aspherical mirror, fabrication of the secondary is a considerable challenge and the result will be a truly remarkable example of precision optical engineering. As with many elements of the ELT it will be a genuine first in this area of technology. The total weight of the secondary mirror and its support system is 12 tonnes — and since it hangs over the primary great care must be taken to prevent the mirror from falling! Most current large telescopes, including the VLT and the NASA/ESA Hubble Space Telescope, use just two curved mirrors to form an image. In these cases a tertiary mirror is sometimes introduced to divert the light to a convenient focus — that mirror is typically small and flat. However, in the ELT the tertiary also has a curved surface, the use of three mirrors delivering a better final image quality over a larger field of view than would be possible with a two-mirror design. The contract for the polishing of the secondary mirror has already been awarded. The M2 and M3 cells are complex mechanisms more than 6.5 metres wide and weighing close to 12 tonnes including the mirrors themselves. They provide alignment and tracking capabilities with a high precision hexapod with an absolute accuracy of tens of micrometres. The cells also compensate for mirror surface deformations in the order of tens of nanometres by means of an innovative solution using warping harnesses and lateral supports. At this time 3288 have been firmly ordered (for the ELT Phase 1) and an additional 1320 will be included in the ELT Phase 2, making 4608 in total.